Hi girls!! 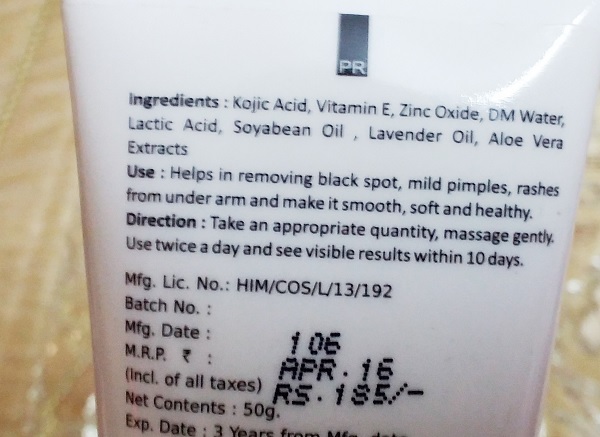 Do you have darker underarms/ Do you wish to lighten them by suing a readymade product and not the home remedies? Then I have a product for you! You know when we wear sleeveless clothes, the first thing we take care of is the underarms, like we will get rid of the underarms hair first but we can also notice that there is still some darkness that can be due to regular shaving etc. I will do a review on this Qraa Lacto Underarm Black Spot Treatment Cream which is made to lighten the dark spots on the underarms. 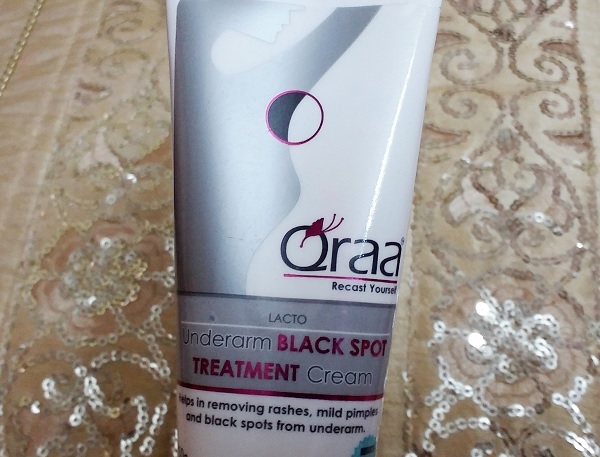 Price: Qraa Lacto Underarm Black Spot Treatment Cream is priced for 185 rupees. Claims: With extensive research, Qraa Under Arm Whitening cream is the only product in current market that instead of hiding the darkness of underarms by leaving a white patch, treats the cause of darkness by reducing melanin from there. Qraa Underarm cream lightens your skin to reveal visibly fairer and smoother underarms. Its natural ingredients, Licorice extracts and Witch Hazel, reduce melanin production and soothe skin's irritation to reveal fairer, whiter underarms.It has high quality natural herbal extracts that are proven to reduce rashes, mild pimples and dark spots from your underarm. Visible results can be seen within 10 days of use. So from now on, there’ll be nothing holding you back from wearing your favorite sleeveless dress anymore! By the way, this is a cream not a cream pack, so, you have to apply it and leave. Earlier I thought it will be like a cream that we have to apply on the underarms and leave for some time. No, this has to be applied like face cream. The cream is white in color and has a peppermint like fragrance. The cream is thick and gets applied easily. I will massage the underarms with this easily. Actually, I take around a pea sized amount and will rub over the underarms. While I am massaging the cream, I do not feel that the cream is making the underarms skin greasy or oily. I think it is always good since I do not like greasy products for the underarms. When use it, I also noticed that is I feel that this cream gives a cooing sensation to the skin. This underarm lightening cream has the ingredients like licorice which is also known as mulethi. This will make the skin complexion fairer this is why licorice is used a lot in so many fairness skin care products. This also has lactic acid which removes the tan and darkness. Moreover, this cream has kojic acid which is used in skin whitening soaps, creams etc. Kojic acid is very popular to make the skin fairer. After using this creams for around 2 weeks I feel that this has lightened the skin to some extent and has shown positive changes. The results are good but it will need some more time. I think at least 3-4 weeks but in the claims, I was reading that it says that within 2 weeks it will treat but yes, that is also true that this cream has given good results. This is a decent cream that lightens the darkness on the underarms to good extent and I also think that a readymade product to lighten the underarms is also good This is not very readily available in the market but online you can buy this from Amazon, Flipkart, eBay. This will take around 2 weeks to get rid of the dark underarms but this will also take longer if the darkness is more. Must try, I will check it out.